Federal-Mogul Corp. is helping Suzuki make the 1.2-liter gasoline engine in its new Swift more efficient and more compact by supplying an innovative heat-shielding solution. The U.S.-based supplier uses its so-called Flexguard protection on the Swift’s water hoses. The protective sleeve is 83 percent lighter and 44 percent narrower than conventional rubber sheathing. The weight reduction contributes to the new Swift’s CO2 reduction to 116 grams per kilometer from 140g/km in the car’s previous generation. Another benefit of the improved sleeve is that Suzuki can route the Swift’s hoses closer to other systems. This resulted in a tighter engine compartment, which helped increase occupant space inside the car. Denso Corp. supplies a number of key powertrain parts to the Swift, such as fuel pumps, the electronic throttle valve on the gasoline model and the intercooler on the turbo diesel model. The company also supplies the horn, HVAC system and the front wiper system. Rieter AG supplies the Swift’s center console and dashboard. Other important suppliers include: Mitsubshi Electric Corp. for the alternators and engine sensors, including the cam and crank sensors; Calsonic Kansei Corp., which provide the motor fans and radiators; and NTN Corp. which supplies the front and rear axle bearings and the front constant velocity joints on the gasoline version. Suzuki builds the Swift at its plant in Esztergom, Hungary. IHS Automotive forecasts 61,497 Swifts will be produced in 2011, with volumes likely to stay steady through 2012 as well. 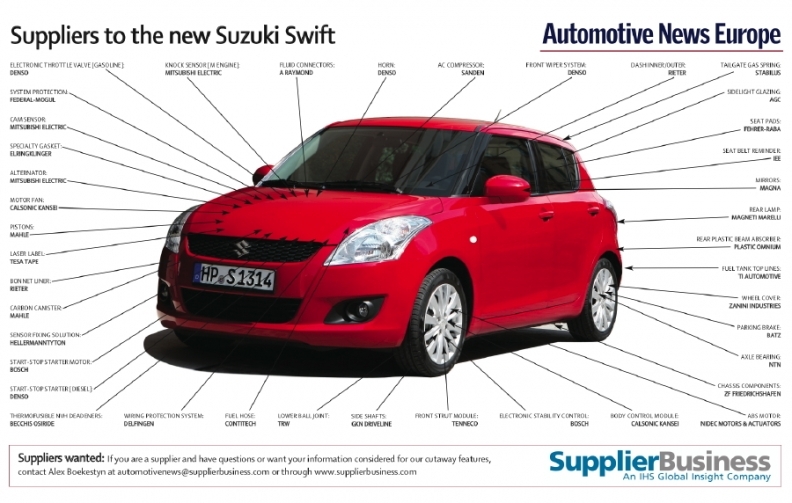 Suzuki invested 250 million euros ($360 million) in the plant last year specifically for the new Swift model. Suzuki also offers the Swift with a 1.3-liter diesel engine. The car, which comes in three- or five-door versions, starts at 10,990 euros in Germany.